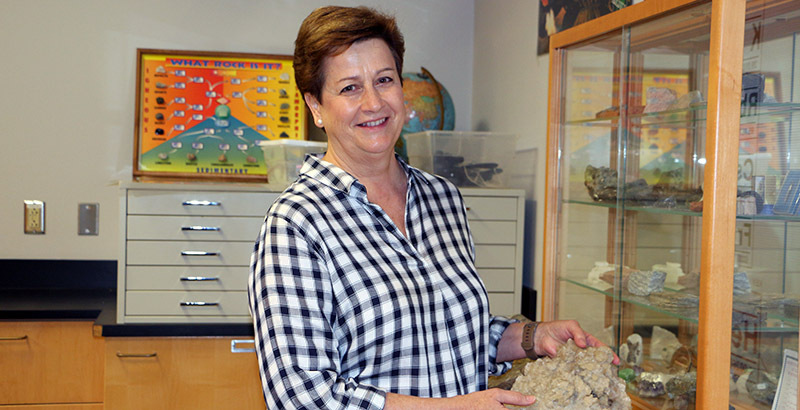 Meet Debra Duffy, who teaches geology and oceanography at Tidewater Community College’s Norfolk Campus. Duffy joined the college as a full-time faculty member in 2016 after working in industry and teaching at a local private school. I took a geology class in college because I didn’t want to take biology or physics. After that one class, I was hooked. I went on to earn a bachelor’s and a master’s in the subject. After graduation, I worked as a geologist for Applied Marine Research Laboratory. My work was fieldwork intensive involving wetland delineation and mitigation projects. I enjoyed it all despite the tick bites and stings! When the research laboratory closed, I reinvented myself as a teacher. I love science and geology, and I had young school-age children, so it seemed like a good fit. I actually started teaching as an adjunct at TCC in 1987, but really got into my start when I was hired by Cape Henry Collegiate to teach earth science, AP environmental science and geology. Right away, I enjoyed the students’ energy and passion. That spurred me to earn my Ph.D.
Why is learning environmental science so important for today’s students? Our young people are being handed a mess with our environment. I want to provide them with a good understanding of how science works so we can put some passion into sustainability. By working together, we can find solutions to the problems we are facing with human-induced climate change and move forward in clean energy. What do you love about teaching at the community college? I enjoy hearing my students’ stories. I love the community college because we have people of different ages, experiences and backgrounds. This diversity makes classroom discussions really rich. I love seeing adult learners come back and do a fantastic job. And also I like watching recent high school graduates develop good study habits and get great grades. I’m a Norfolk native, and I know the area and the history well. I incorporate my knowledge of the local area into lessons to help students make meaningful connections. I enjoy creating my own laboratory activities in lieu of textbook-published materials. I also enjoy taking students on field trips. 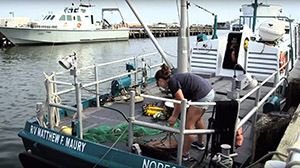 Oceanography students get to experience shipboard research methods on TCC’s boat, the R/V Maury. I also like to have students participate in service-learning projects. One of my favorite places to do this is the Norfolk Environmental Action Center – an environmentally sustainable building with solar panels and a rain garden. Having students participate in these activities shows them how they can make a difference in their community. I like it when investigations are student-driven as they work to find and analyze their results. I also really like to have students outside in natural marshes where they can develop their observation skills identifying plants and looking for evidence of turtle nesting sites. I have a variety of things to read – ranging from science news magazines to political books to history of science reads. I also like fiction, especially books by Jodi Picoult. Most memorable class in college? In my undergraduate program, almost every higher-level course required an overnight field trip to study rocks and landscapes. The people in my classes became dear friends because of the time we spent together. I’m an avid Jazzerciser! I also love visiting vineyards for tastings and the scenery. I enjoy time at our family cabin on the Yeopim River in North Carolina. I also love to take walks with my favorite furry – Bentley the Pomeranian. I’m married to Bernie and we have two children. Hannah, 26, graduated from East Carolina University and holds a full-time event planning position in Washington D.C. Sean, 21, is a junior at Western Carolina University studying computer information systems. He also races on the mountain bike circuit.